I spent a lot of time working on my classroom library yesterday and it is ready. I was thrilled to create new tubs in several categories that I felt were a little lacking. One of those categories was sports books. And I just read an amazing novel about baseball that would be the perfect addition to the tub: Out of Left Field by Ellen Klages. Publisher’s Summary: Every boy in the neighborhood knows Katy Gordon is their best pitcher, even though she’s a girl. But when she tries out for Little League, it’s a whole different story. Girls are not eligible, period. It is a boy’s game and always has been. It’s not fair, and Katy’s going to fight back. Inspired by what she’s learning about civil rights in school, she sets out to prove that she’s not the only girl who plays baseball. With the help of friendly librarians and some tenacious research skills, Katy discovers the forgotten history of female ball players. Why does no one know about them? Where are they now? And how can one ten-year-old change people’s minds about what girls can do?Set in 1957—the world of Sputnik and Leave It to Beaver, saddle shoes and “Heartbreak Hotel”—Out of Left Field is both a detailed picture of a fascinating historic period and a timelessly inspiring story about standing up for equality at any age. Although we know that Katy doesn’t win her battle to play ball – that would be a work of alternative history – you can’t help but admire her passion and dedication to baseball. Just We can look to those who came before us to ignite our passion for justice just as Katy took inspiration from all the women she learns about who played ball before her. Out of Left Field by Ellen Klages is advertised as the third book in the Gordon Family series. I had to look that up and remembered how much I had loved The Green Glass Sea and White Sands, Red Menace. I might need to reread those. So many books, so little time! 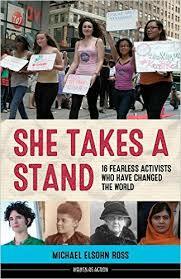 In She Takes a Stand: 16 Fearless Activists who have Changed the World author Michael Elsohn Ross has written an inspiring collection of short biographies featuring 16 contemporary and historical women from around the world who have advocated for change around issues of injustice in its many guises. Each chapter tells the story of one activist who passionately fought for equal rights at great personal cost. Causes included the rights of girls and women for equal access to the same liberties as men (to vote, for birth control, for education, for safety), to stop global crony capitalism, to support worker’s rights and many others. This book is designed for slightly older readers. The text is set up fairly traditionally and each chapter has one black and white photo of its subject. This might be off-putting to someone who stumble sup on this book on the shelves but budding activists and lovers of non-fiction will enjoy the book if they take it off the shelf. Ross explains things clearly, with an emphasis on childhood details, motivations, and life turning points. The book includes related sidebars, a bibliography, source notes, and a list of activist organizations.